This is a lazy version of peanut brittle - super quick, easy and surprisingly highly addictive. - Grease large cookie sheet. - In large bowl measure out cornflakes and peanuts. - In saucepan, combine syrup and sugar over medium heat, stirring constantly. Once sugar has dissolved, stir in peanut butter until it has completely melted. - Pour over cornflakes, swiftly tossing and coating. Dump out on greased cookie sheet, spreading and pressing out. - Chill. Once completely cooled break up into bite size chunks. Oh my Gosh. That sounds like a little piece of perfection. I may be trying that. These look yummy. I'm a cornflake freak and adding peanut butter to the mix sounds too good. Wow... This sounds delicious - I fear if I make it I'll eat it all myself! 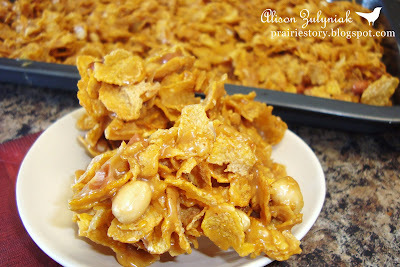 I love this recipe - growing up we called it Cowboy Crunchies! Yum! Ooh this sound yummy! And I love the lazy version of anything!! !